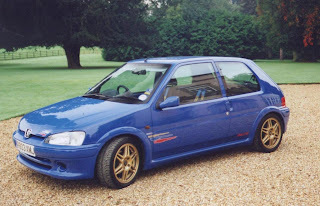 The Peugeot Super 106 Cup for 1999? In 1998, as work life settled down a bit I had more time to plan our rallying debut! The wife (although stil girlfriend at the time) was up for a challenge too, but was more keen on buying a Ducati 948 whatever blah, blah than rallying, but some gentle persuasion soon rectified that. What really pushed things on was another lunchtime at work, trying to decifer the techo-jargon in Motorsport News (im not from a 'car family'!) I spotted the launch of the Peugeot 'Super 106 Cup' for the forthcoming 1999 season - with some interesting comments about a level playing field, low-budget and ideal for newcomers to the sport. I tucked a few pennies away, and upgraded to a newer Mk2 'Rallye', which the one-make championship would be based on (in 16v guise) to get some useful knowledge of the car. The cup car came as a std road car with a parts package to convert it to a rally car - so I need a mechanic, and quick! I popped along to see a chap i had met about 5 years before Des Griffiths, a superb mechanic and straight down the middle, no bulls*it. We talked about building the rally car, but on inspection of the info from Peugeot, this was to be no simple task. Not exactly servicing a cavalier...mmm? Hey, guess what - a few months later it started to dawn on me this rallying lark is a bit complicated! Stella Boyles was very helpful with advice and guidance, and put me in touch with a couple of guys who were also planning to do the championship and ran a local rally school - Dave Nutt and Pat Jackson of Vision Motorsport, then based at Westcott near Aylesbury. A few chats with Dave and Pat, and the penny started to drop...maybe the 106 Cup was a bit too much to chew off for a first go! After a days 1-2-1 tution with Dave at Westcott, and a subsequent day with the Higgins at Carno (Forest Rally Experience) in the woods, I toyed with dropping the whole idea!!! Thankfully, Stella and Peugeot were fine with us pulling out of the Cup (even though our car had arrived from France and was awaiting delivery) which by now had taken a few steps away from its original 'budget' premise, as Michelin tyres were now compulsory as announced at the Autosport Show. So it's early 1999 and no car, what do we do now?